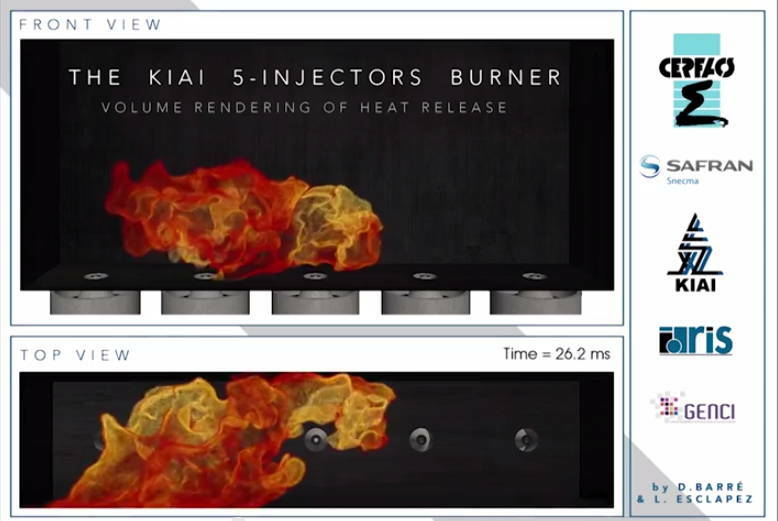 Ignition of KIAI (CORIA) swirled burner in partially premixed conditions. 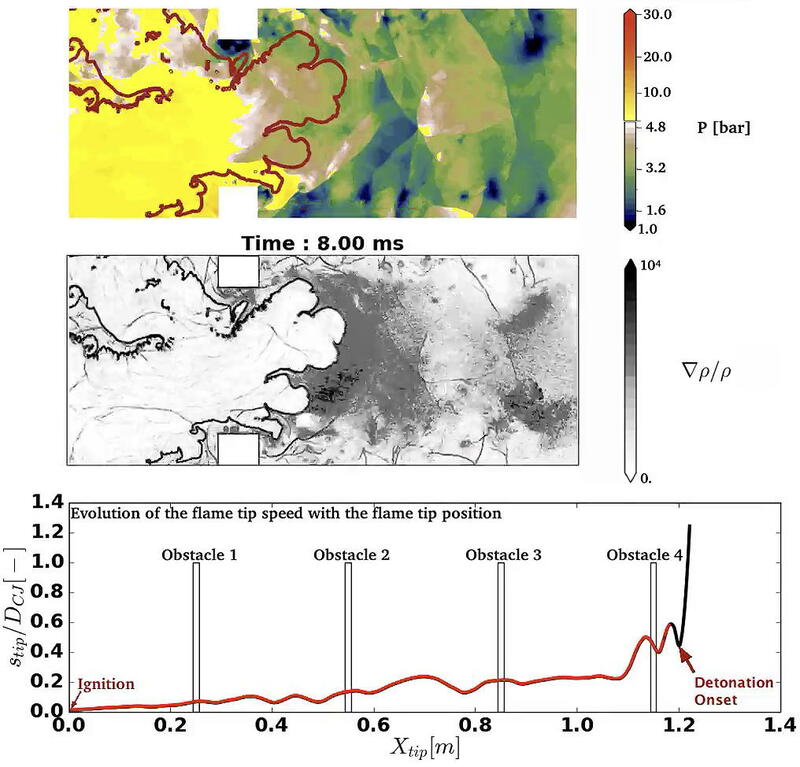 Flame tracked by isosurfaces of temperature colored by heat release. 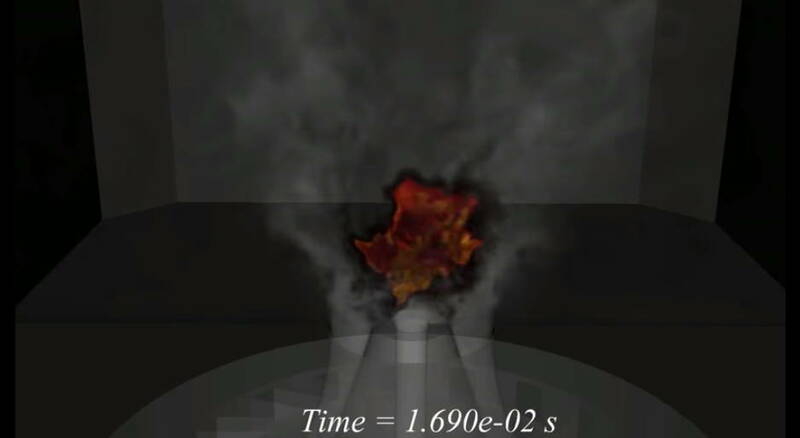 Large Eddy Simulation of ignition in the 5 burners KIAI (CORIA) test facility. 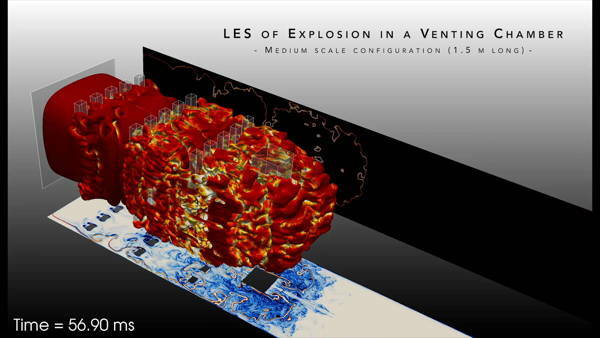 Flame visualization by volume rendering of heat release. 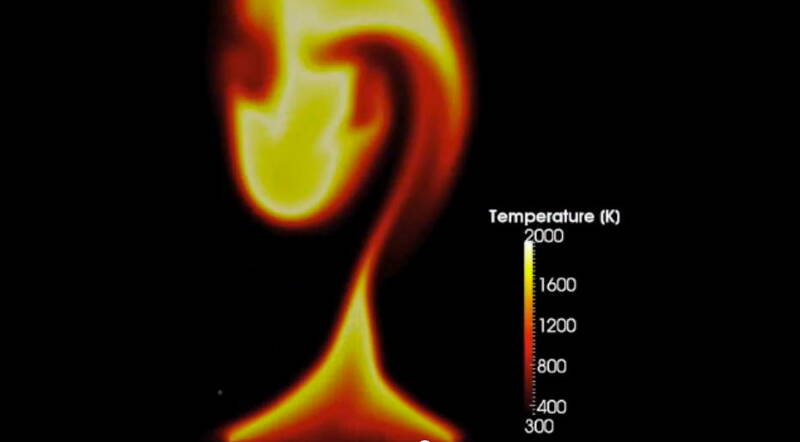 Partially premixed combustion in KIAI (CORIA) burner illustrated by the temperature field. 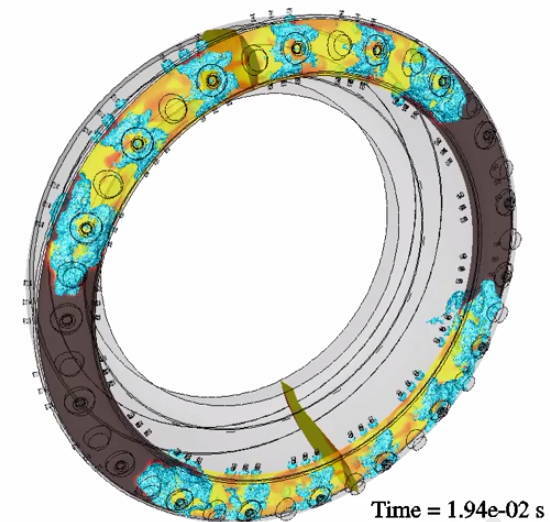 Vorticity field in a high pressure turbine stage with TurboAVBP. 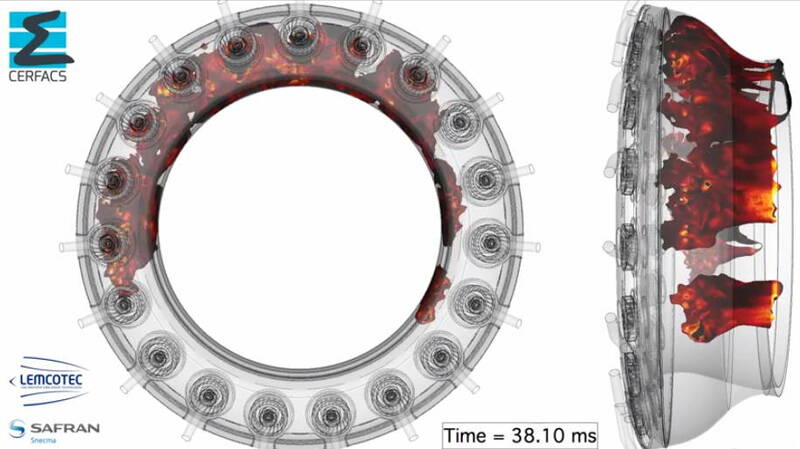 Mesh movement in a 4-valve piston engine configuration. 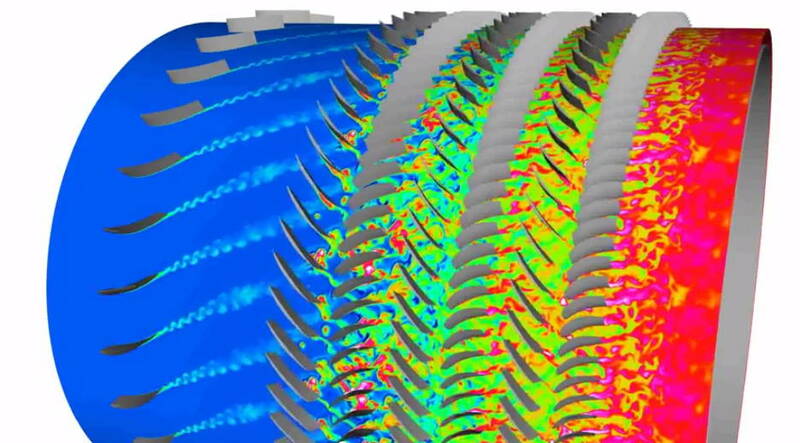 Multi-cycle Large Eddy Simulation of a 4-valve piston engine. Cyclic variability in a 4-valve spark ignited engine (F7P engine, unstable operating point by dilution). 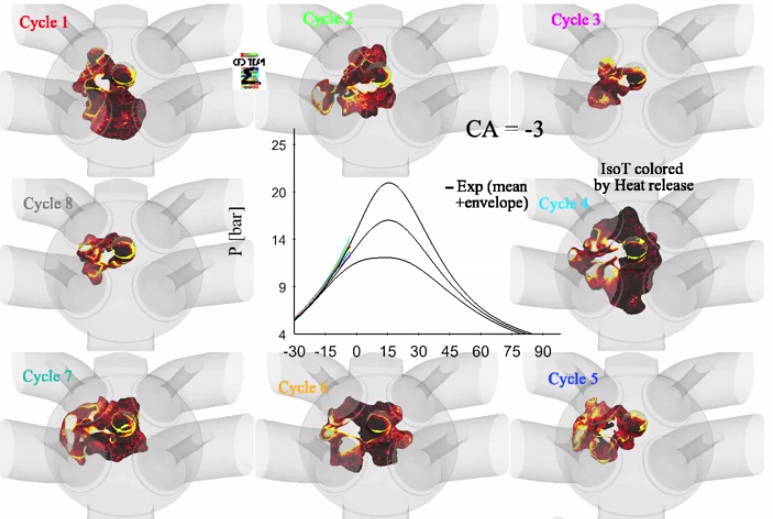 Cyclic variability in a 4-valve spark ignited engine (F7P engine, unstable lean operating point). 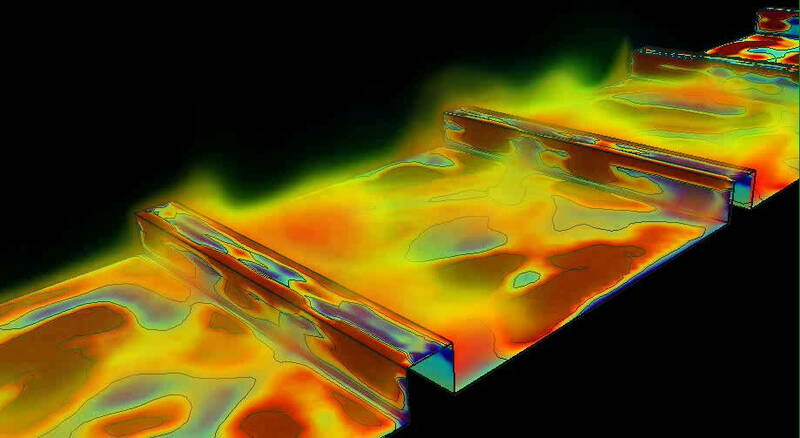 Turbulent flow in a square ribbed channel. 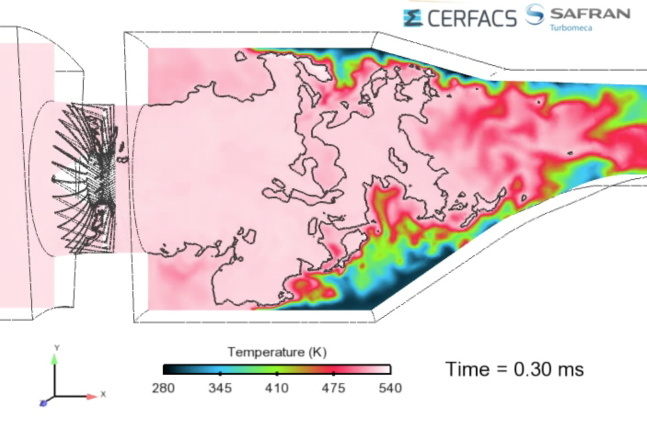 Unsteady evolution of the high temperature (volume rendering) and the heat flux (contours on walls) in a heated ribbed channel. Conjugate heat transfer in a multiperforated plate. 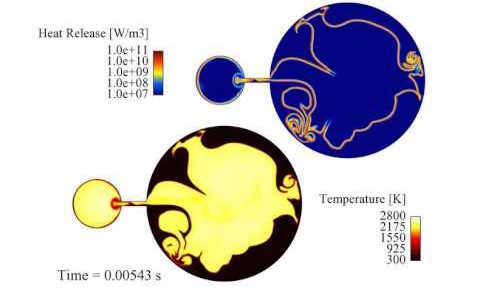 Large eddy simulation of an impinging jet at Reynolds number 23 000 with conjugate heat transfer. 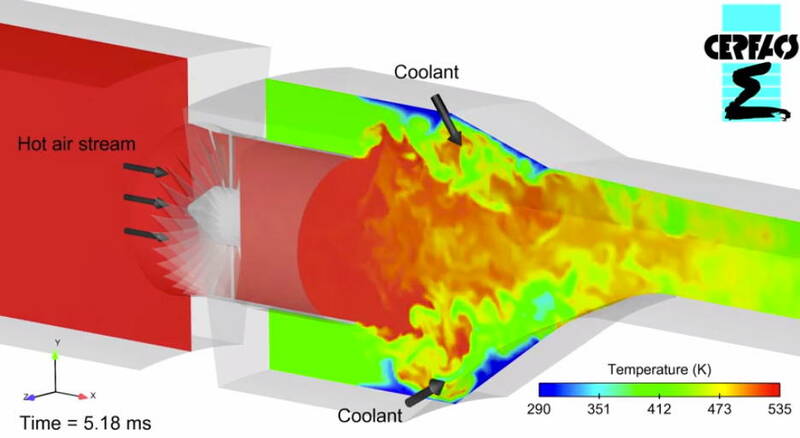 Large Eddy Simulation of the propagation of an octane/air flame in a fan-stirred bomb. Velocity field (gray scale) and iso-surface of temperature T=1500 K (red). 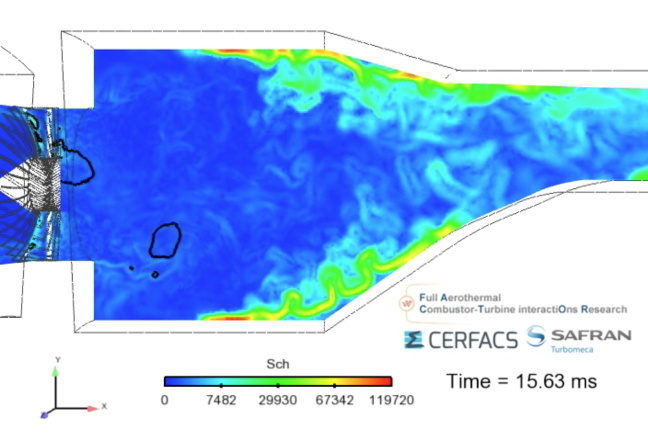 Large Eddy Simulation with TurboAVBP of the turbulent flow field in a fan-stirred combustion vessel. 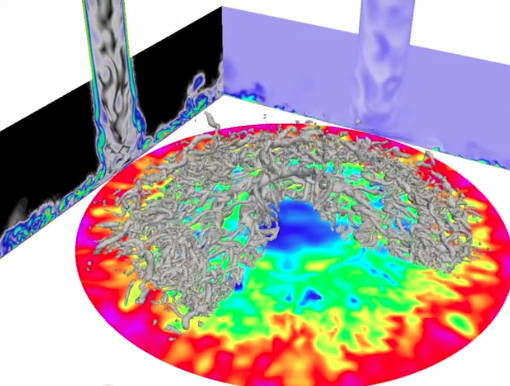 Large Eddy Simulation of a closed vessel stirred by 6 rotating fans. 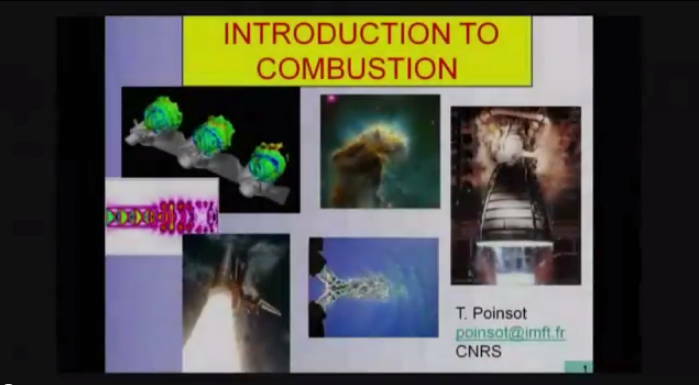 Introduction to combustion, part 1. 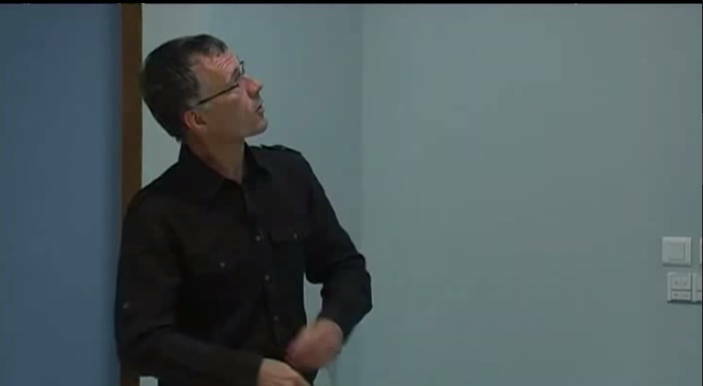 Introduction to combustion, part 2. Introduction to combustion, part 3. Introduction to combustion, part 4. Introduction to combustion, part 5. Introduction to combustion, part 6. Introduction to combustion, part 7. 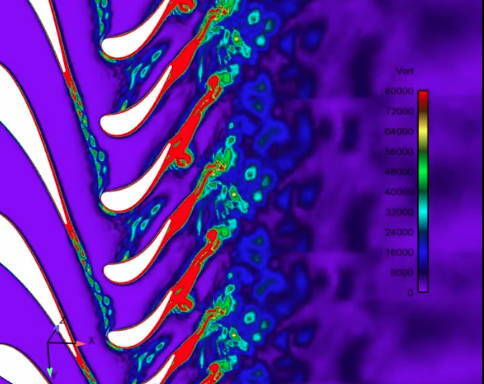 Acoustic instability in a combustion chamber. 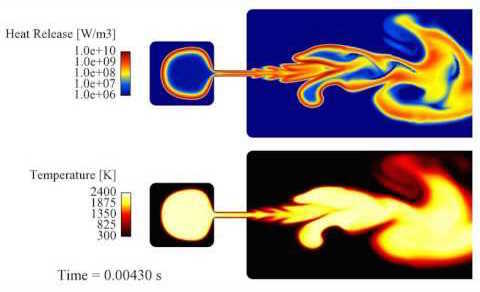 Ignition of a turbulent methane jet (fuel=70% CH4 and 30% air in volume), ignited by an electrical spark (100mJ, 400 micro-second, electrode gap: 1mm). Isosurface of equivalence ratio = 1 (blue) and of mass fraction of H2O (Y=0.5) colored by the temperature. 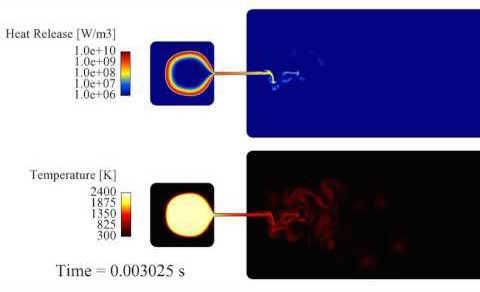 Ignition of a turbulent methane jet (fuel=70% CH4 and 30% air in volume), ignited by an electrical spark (100mJ, 400 micro-second, electrode gap: 1mm). 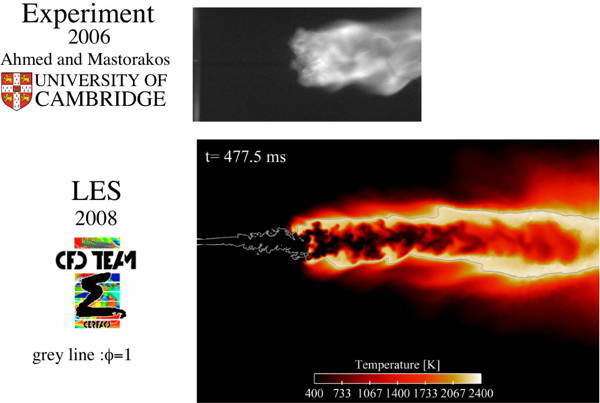 Comparison between high speed images from the experiment of Ahmed and Mastorakos and temperature fields from the LES. 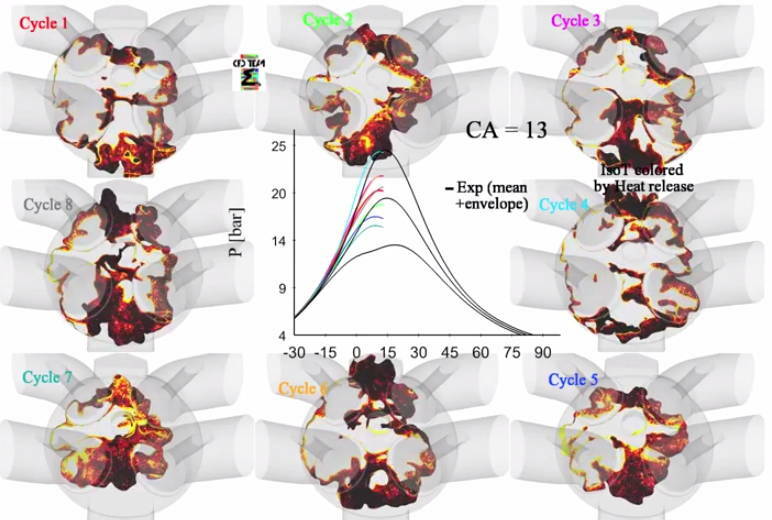 Large Eddy Simulation of ignition in the MICCA annular premixed methane/air burner (EM2C). Iso-surface of velocity magnitude (blue) and iso-surface of temperature colored by axial velocity. 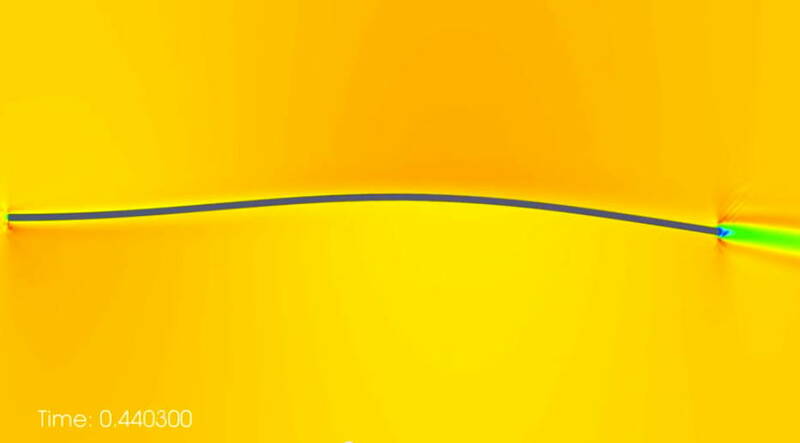 Q-criterion colored by axial velocity in a ribbed pipe. 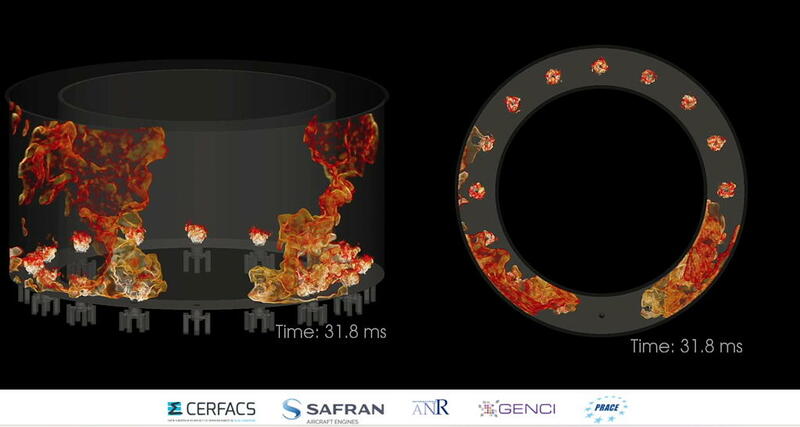 Large Eddy Simulation of ignition in an annular combustion chamber. 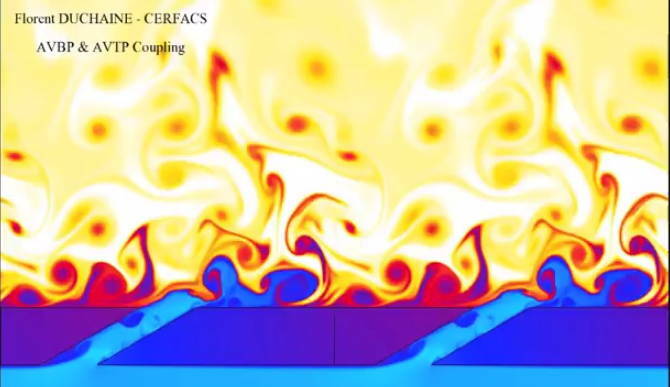 Thermoacoustic instabilities in an annular combustion chamber. 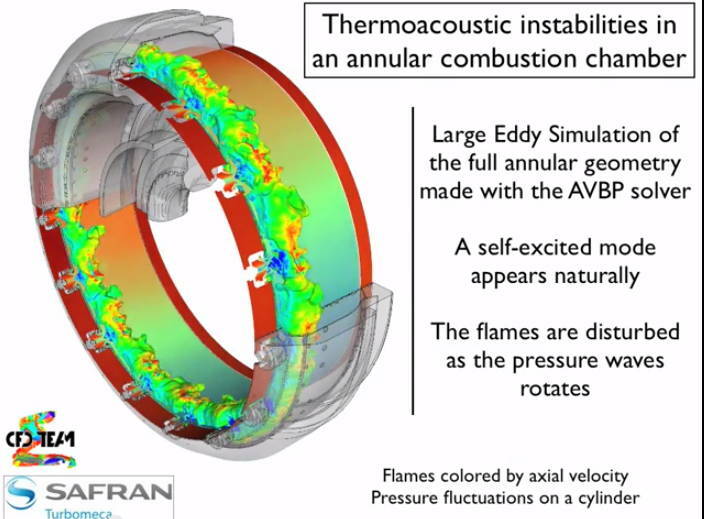 Large Eddy Simulation of the full annular geometry. 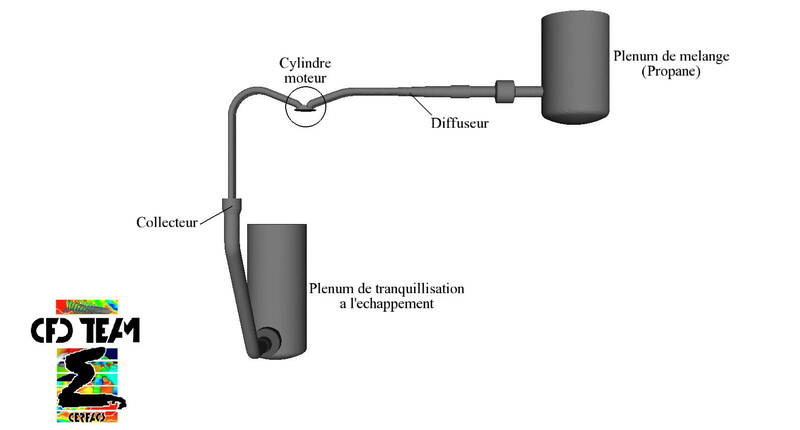 LES of altitude relight of the low-NOx LEMCOTEC combustion chamber. 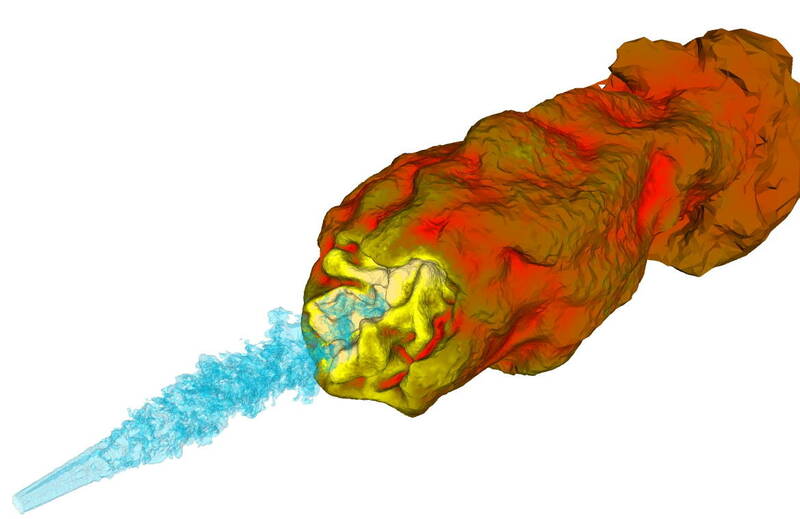 Large-Eddy Simulation of the 3.5 stage high-pressure compressor CREATE (Ecole Centrale de Lyon/LMFA) with TurboAVBP. Entropy at iso-radius during 1/16 revolution. Reduced mass flow configuration (operating point close to surge). 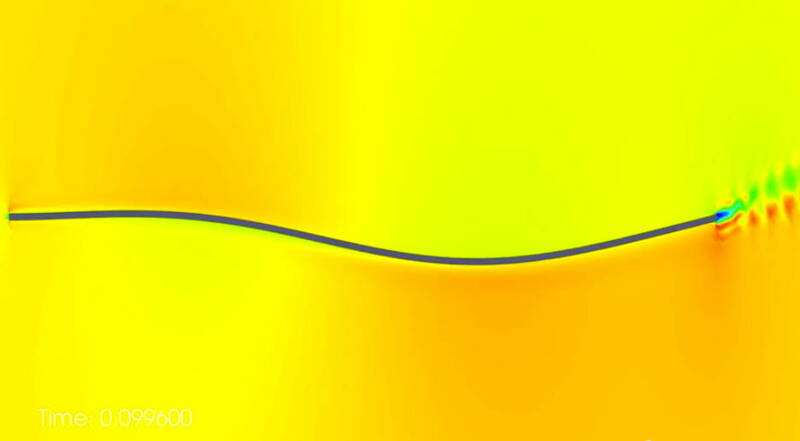 Large Eddy Simulation of a multipoint injector (two-phase flow Euler-Lagrange computation). Droplet temperature. Large Eddy Simulation of a multipoint injector (two-phase flow Euler-Lagrange computation). Spray topology. Pollution dispersion in lower Manhattan. 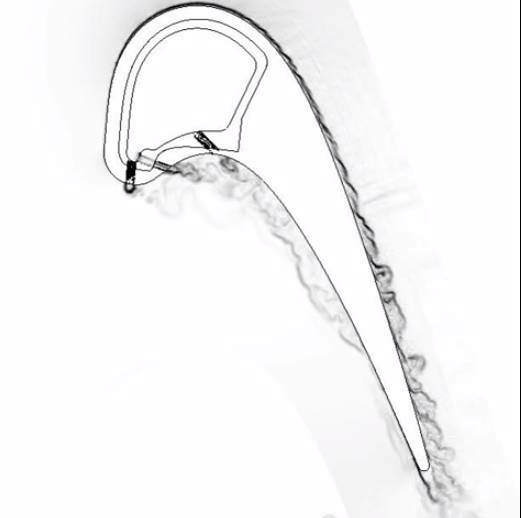 Large Eddy Simulation of the high pressure blade cascade LS89 (VKI). Density gradient visualization. 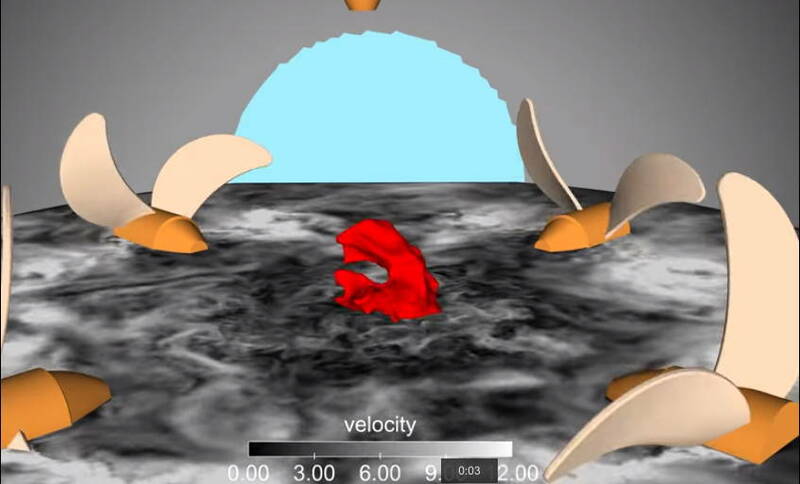 Large Eddy Simulation of the high pressure MT1 stage. 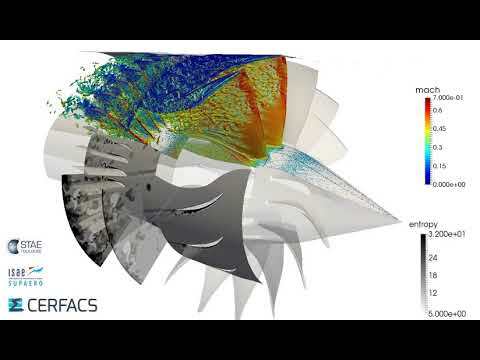 Flow topology visualization by mean of pressure contours. 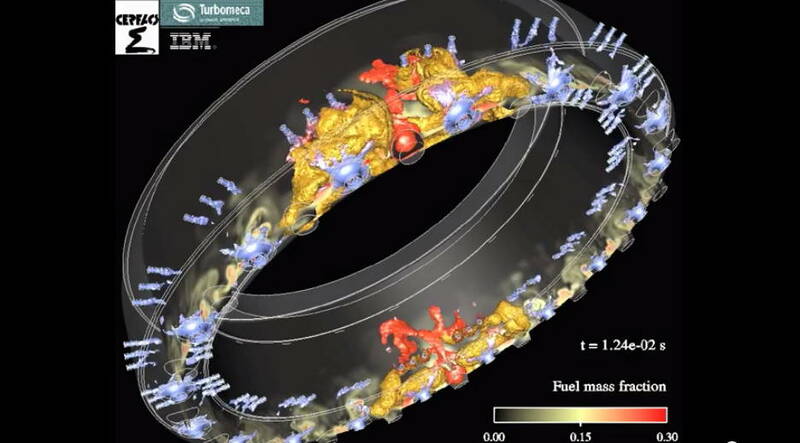 Large Eddy Simulation of the high pressure MT1 stage. 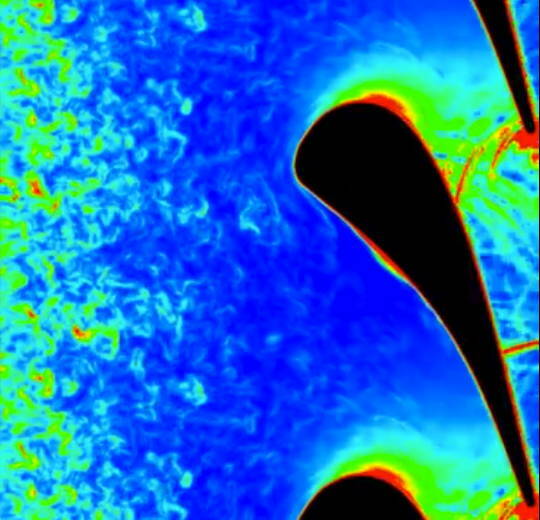 Flow topology visualization by mean of the density gradient and vorticity contours. 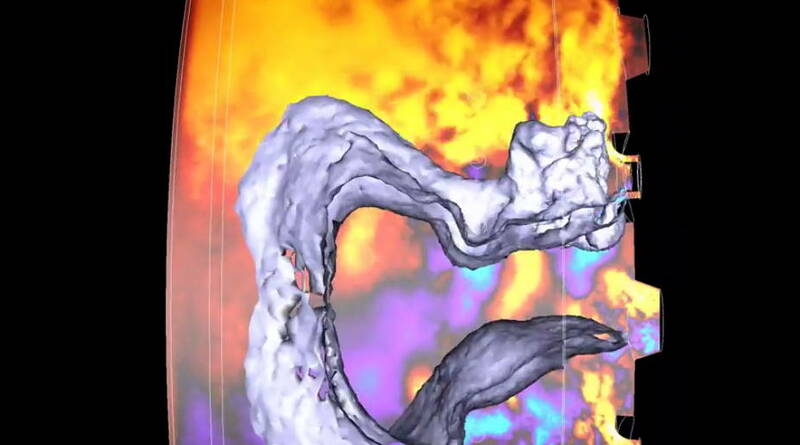 Large Eddy Simulation of the high pressure MT1 stage. 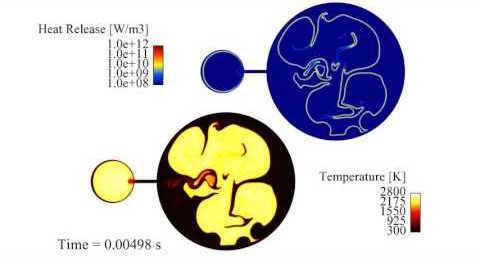 Flow topology visualization by mean of temperature contours. 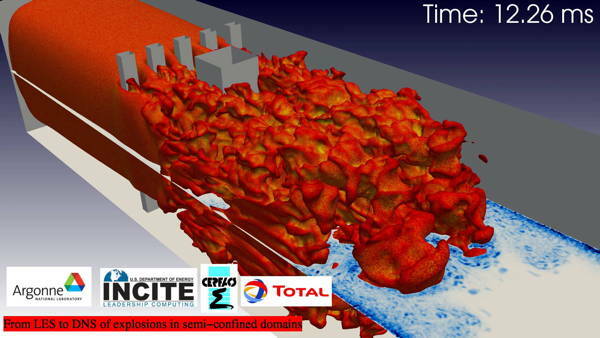 Large Eddy Simulation and conjugate heat transfer of the high pressure T120D Cascade (AITEB II European project). 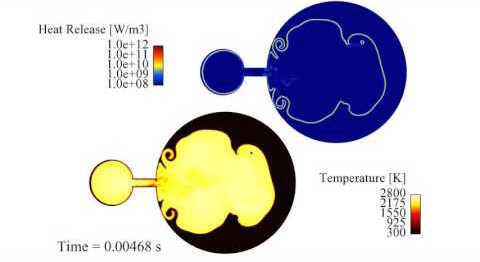 Solid temperature and iso-surface of cold and hot fluid temperature. 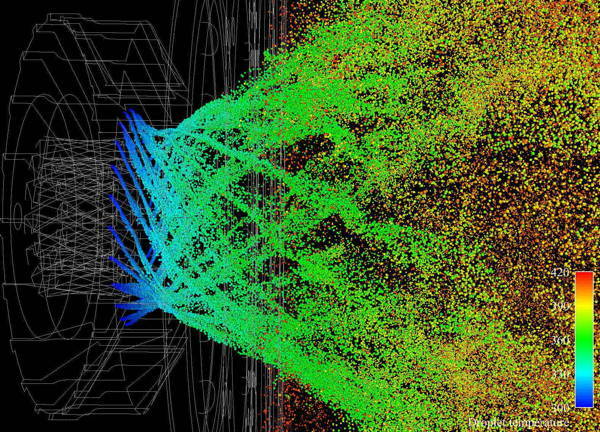 Large Eddy Simulation of the high pressure T120D Cascade (AITEB II European project). 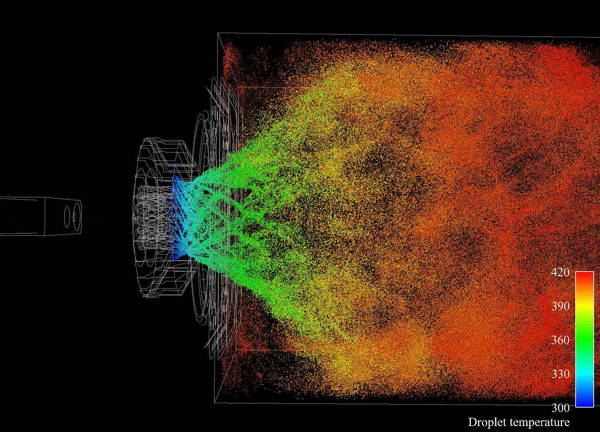 Flow topology visualization by mean of the density gradient. 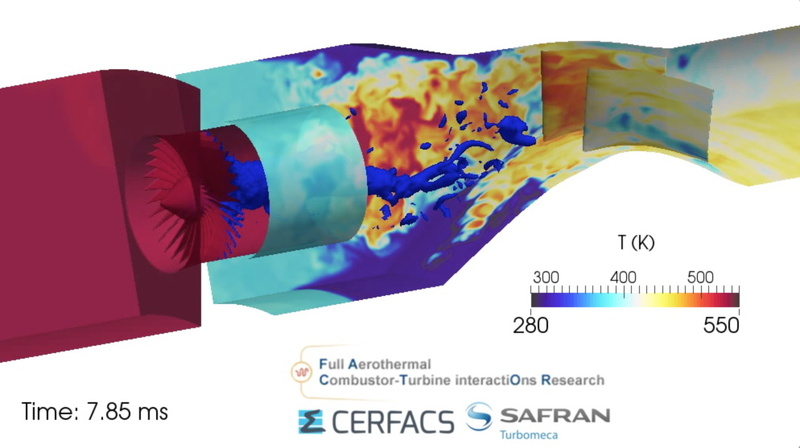 Large Eddy Simulation of the combustor simulator from the European project FACTOR. 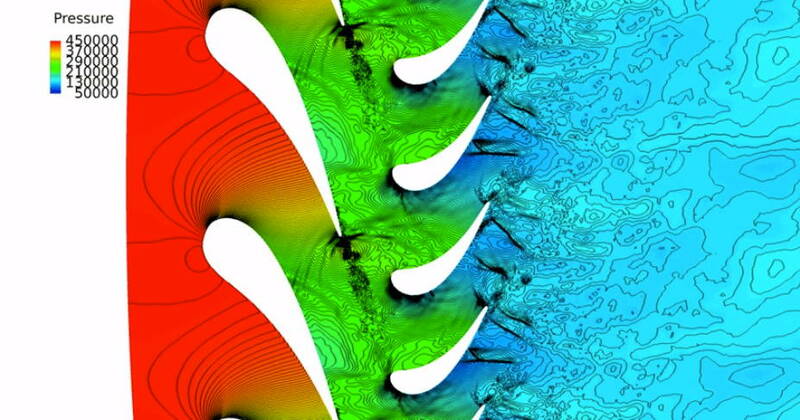 Large Eddy Simulation of the combustor simulator from the European project FACTOR. 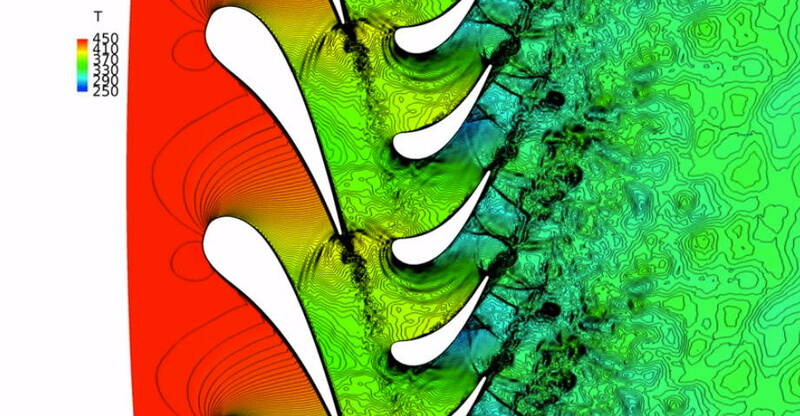 Temperature field in the combustor simulator and nozzle guide vanes. 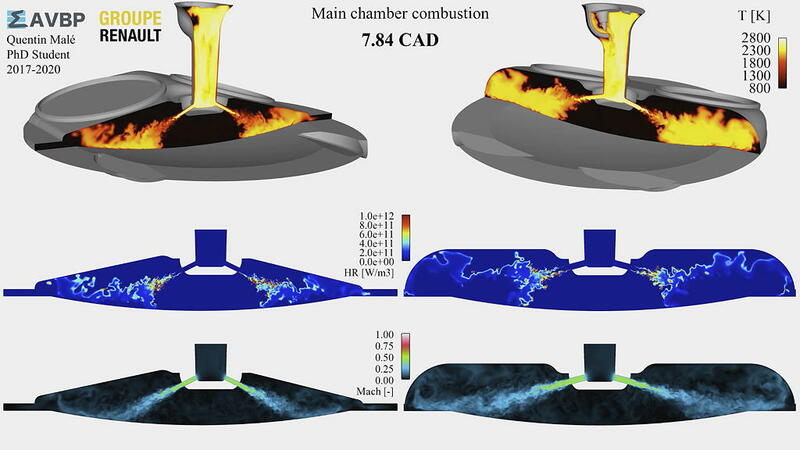 Large Eddy Simulation of the combustor simulator from the European project FACTOR. Effect of the duct size. Temperature in the middle plane of the configuration. 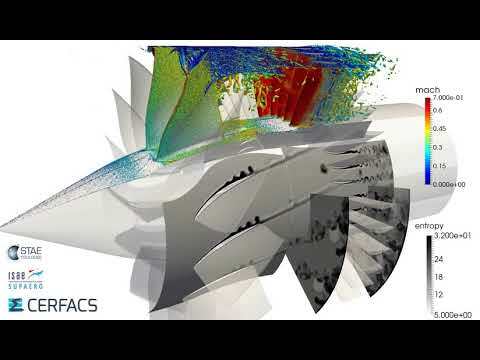 Large Eddy Simulation of the combustor simulator from the European project FACTOR. Effect of the duct size. Gradient of density in the middle plane of the configuration. 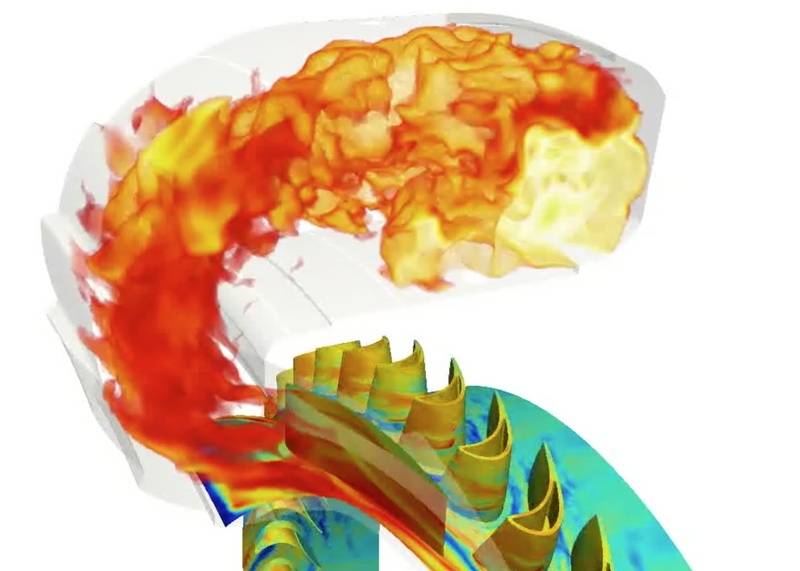 Large Eddy Simulation of a joint combustion chamber and turbine on an industrial configuration. 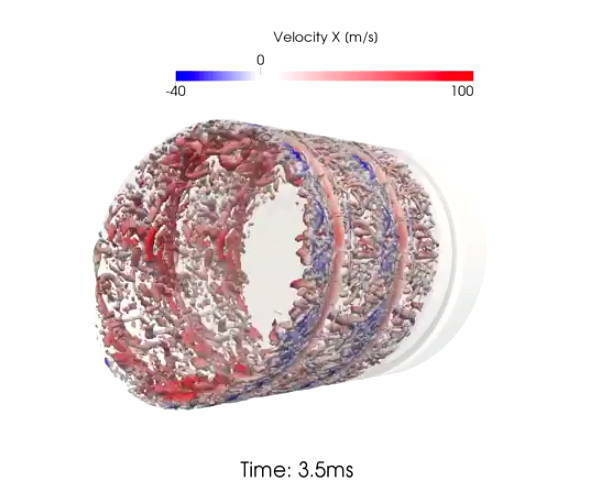 Large Eddy Simulation in an actual turbofan stage. Wall-modeled Large-Eddy Simulation in the DGEN-380 (Price Induction) fan stage with TurboAVBP. Iso-surface of Q-criterion colored by Mach Number and cuts colored by entropy. Double criterion for automatic mesh-adaptation: Y+ = 30 at the wall, kinetic energy dissipation criterion in the flow. 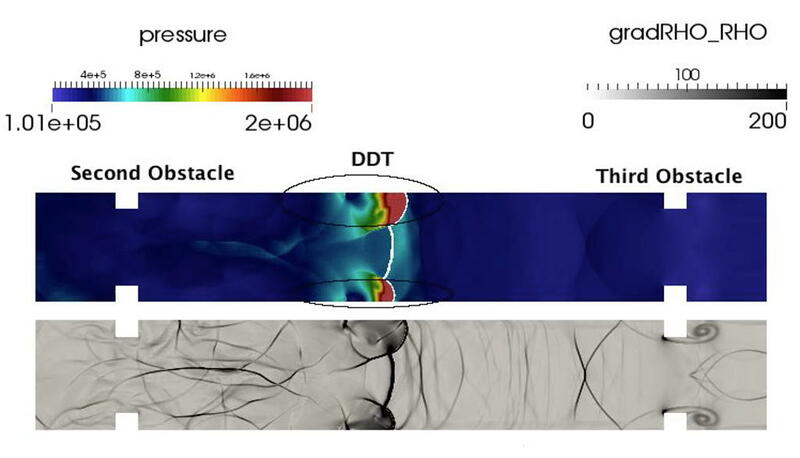 Wall-modeled Large-Eddy Simulation in the DGEN-380 (Price Induction) fan stage with TurboAVBP. Iso-surfac e of Q-criterion colored by Mach Number and cuts colored by entropy. Double criterion for automatic mesh-adaptation: Y+ = 30 at the wall, kinetic energy dissipation criterion in the flow. 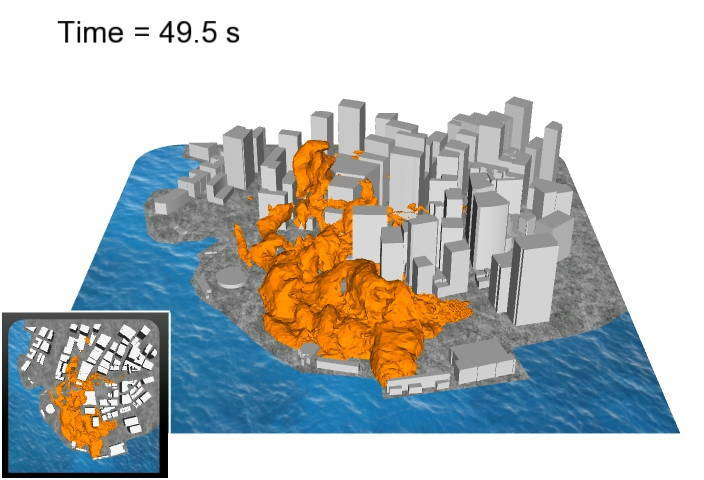 Large Eddy Simulation of a simplified wild fire. Second flutter mode of the flag problem resolved by a fluid/solid coupling (i.e. AVBP and MARC). 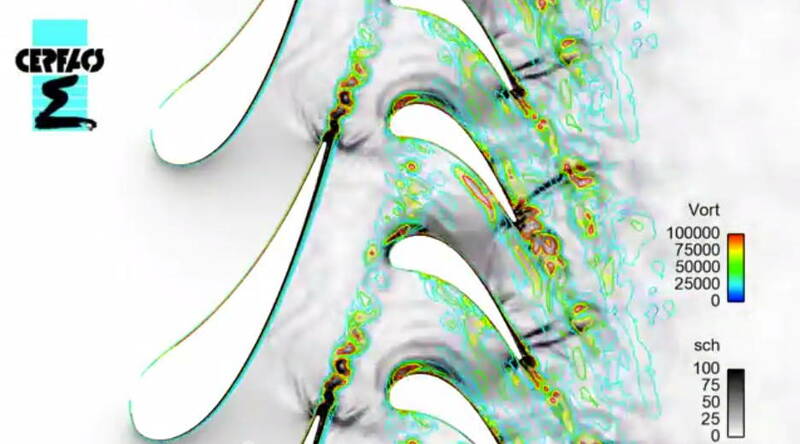 The instability has never been triggered by the user but instead the fact that the mesh of the fluid is not symmetric is a sufficient condition to activate the second mode. Third flutter mode of the flag problem resolved by a fluid/solid coupling (i.e. 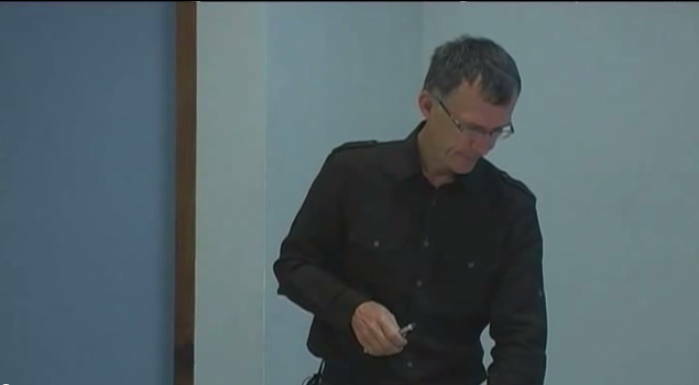 AVBP and MARC). 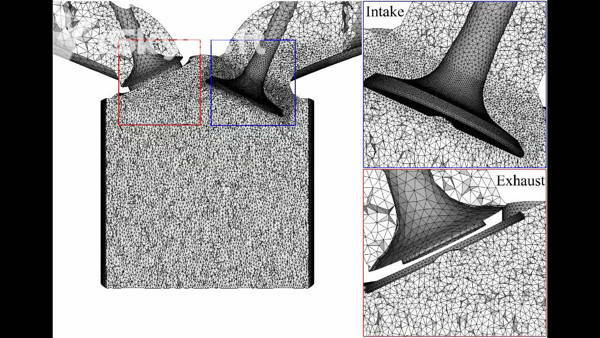 The instability has never been triggered by the user but instead the fact that the mesh of the fluid is not symmetric is a sufficient condition to activate the second mode. 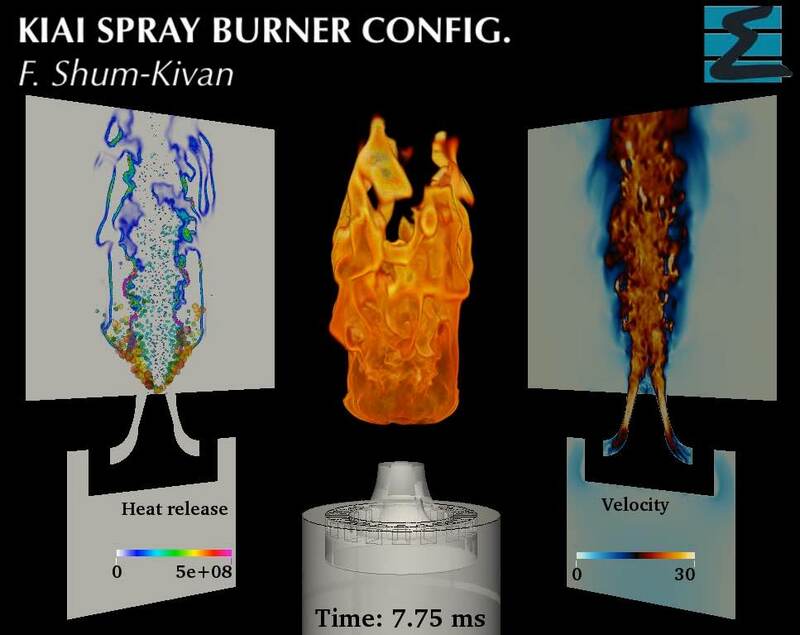 Large Eddy Simulation of the KIAI spray burner. 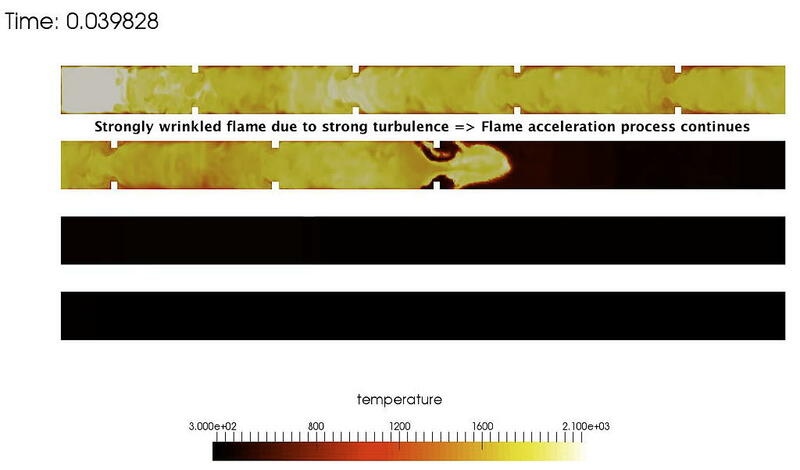 Flame acceleration in an obstructed channel filled with a H2/air mixture (temperature). 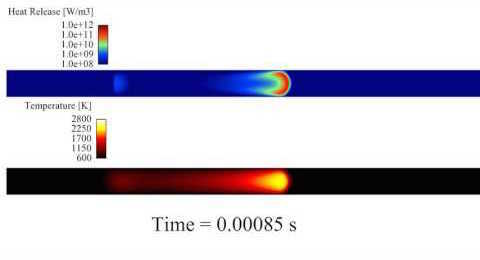 Flame acceleration in an obstructed channel filled with a H2/air mixture (pressure). 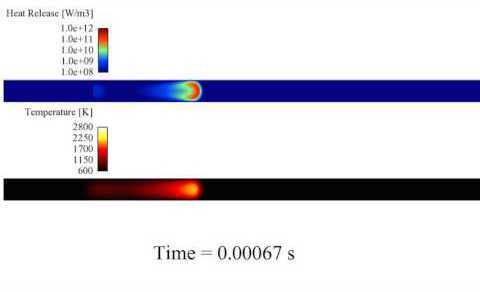 Deflagration to detonation transition in an obstructed channel filled with a H2/air mixture. 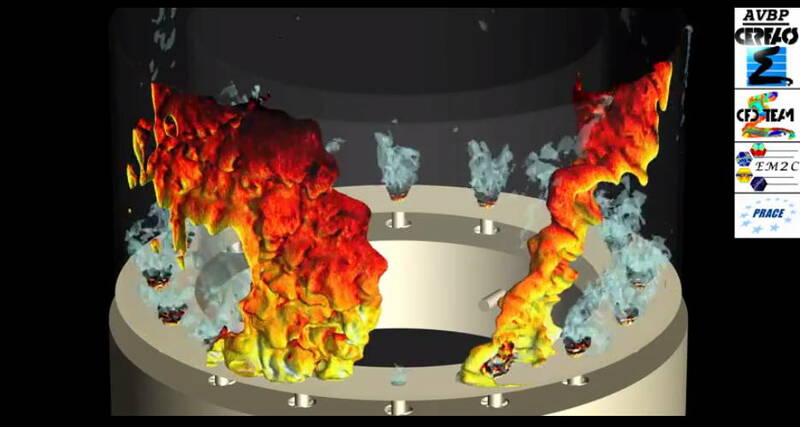 Large Eddy Simulation of two-phase flow ignition in the annular combustor MICCA-Spray (EM2C). 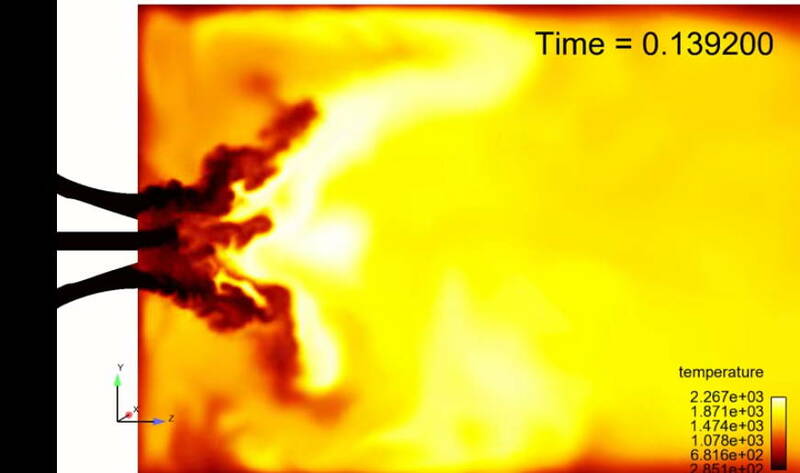 Flame visualization by volume rendering of heat release. 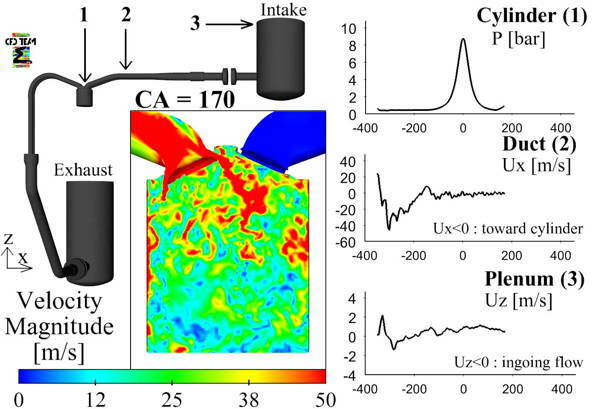 LES of turbulent jet ignition in a lean propane internal combustion engine.